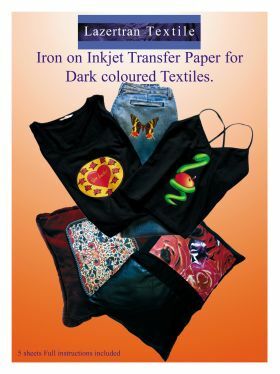 Iron on inkjet transfer paper - transfer your own art, design and images onto dark cloth and and other fabrics. Ideal for making your own t-shirts, cushions, bags and more. Not for use with laser printers. Instruction for using Lazertran Inkjet Textile Transfer Paper dark cloth. This special transfer paper allows you to transfer images using your computer inkjet printer. Print onto the white side of the transfer paper. 1. Switch your iron high and pre-heat. Iron any wrinkles out of the cloth. Do not use steam. 3. Cut the image out. Remember any white areas will show as white after transfer. 4.Release the backing paper by peeling off and place the thin membrane with the image on it face up onto the cloth. 4.Cover the image with the parchment paper provided and iron through the parchment paper applying consistent circular pressure distributing the heat evenly. Concentrate on using the center of the iron during transfer, paying particular attention to the edges of the image. Do not use steam. Heat for 60-90 seconds for small images and 90-120 seconds for larger images. 5. Let the transfer cool then peel off the parchment paper.